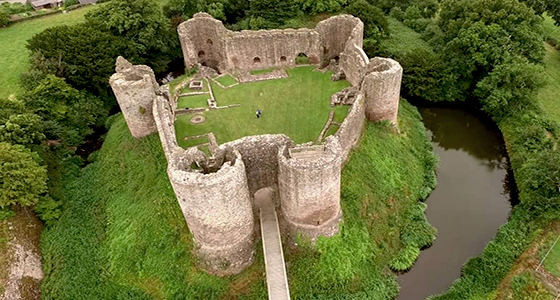 Built in the wake of the Norman invasion of England, Castell Llantilio or White Castle got its name from the coat of white render that once covered its outer walls. The castle survived through turbulent ownership until the 13th Century when it was almost completely rebuilt and used as a military stronghold. By the 15th Century it was disused and by the 16th Century it was said to be in a ruined and decayed condition. Rachel was exceedingly lucky to have the whole castle to herself for the recording session. The only source of sound contamination was from bleating lambs and noisy squawking bird colonies around the moat. It was a chilly, damp and still day with a breeze only passing over high treetops, this thankfully kept wind noise to a minimum. The recording time was just under 30 minutes and in all 12 EVP voices were isolated, over half were class A.
EVP 1: We are not sure whether the speaker thought Rachel resembled a man or he was calling another communicator; either way the voice is not hers but is equally as clear. This clip was captured as Rachel walked around the external battlement wall. EVP 2: Rachel was looking to see evidence of where the kitchen area was and for any stonework that was charred, sadly this has long since faded but the male voice is clearly calling her to leave the room's boundaries. EVP 3: This bright voice was captured in the base area of one of the circular towers. Rachel was looking up as she spoke and could see the holes where supporting timbers would once have been. Part of a staircase remained intact high above her head but it was too dangerous to attempt; the voice seems to echo her thoughts. EVP 4: Against one side of the battlement wall was a very oddly shaped, deep stone recess. Rachel had put the recorder down and wondered away and began to describe the shape. As her distance was proximately 10 ft from the speaker, her voice is feint, however the EVP that is captured is considerably clearer; does this suggest that the generation of the EVP is spatially localised to the dictaphone? EVP 5: Whilst the clarity is poor on this clip it is worth the concentrated effort to hear the speaker because the message is meaningful. Rachel had asked if it would be possible to hear from William fitz Osbern, the Earl whose name we captured at Castell Cas-Gwent, it would be very nice if this was he.